In the Northern province the Chalk Group has been in use informally for a number of years. Its first formal use was by Rhys (1974) [Fig.11/1] to cover the Chalk in the North Sea and by Wood and Smith (1978) [Fig.6/5] to cover the whole of the Chalk succession in the ‘Northern Province’ but this also included the Red Chalk (now excluded from the definition as the Hunstanton Formation). Rawson et al. (1978) [Fig.6/6] utilised the term Chalk Formation to cover the whole of the Chalk (Cenomanian to Maastrichtian). Rawson et al. (2001) [Fig.2/11] formalised the terminology, agreed at the November 1999 meeting, using Chalk Group to cover a lower Grey Chalk Subgroup and a higher White Chalk Subgroup. In the Northern Province the Grey Chalk Subgroup is synonymous with the Ferriby Chalk Formation whilst the White Chalk Subgroup includes the Welton Chalk, Burnham Chalk, Flamborough Chalk and Rowe Chalk formations. The Chalk Group of England has traditionally been divided into three major units, the Lower, Middle and Upper Chalk (Jukes-Browne and Hill, 1903; 1904; and earlier workers, see History of Research above). The separation of Middle and Upper Chalk was based on the recognition of the Chalk Rock at the boundary in the Southern Province. Unfortunately, this marker bed does not occur in the Northern Province, and consequently the classification is difficult to apply and unsatisfactory for this region. Thus, although the main part of the Chalk succession, as originally mapped by the Geological Survey in the 19th century, was divided into three, the Middle Chalk – Upper Chalk boundary lay at a somewhat indefinite horizon (the base of the Sternotaxis plana (now Plesiocorys plana) Zone) within the median unit of ‘Chalk with Flints’ [Fig.6/3 and 6/4]. To resolve these problems a revised classification was introduced by Wood and Smith (1978) [Fig.6/5] and the scheme used herein is based on their account, as modified by subsequent work (Figure 6). Jeans (1980) [Fig.5c/3] retained the term Lower Chalk for the succession present across northern England (Norfolk, Lincolnshire and Yorkshire), and introduced a series of members within this division, based on sedimentary cycles that he first identified on the Yorkshire Coast (Belchford, Dalby/Stenigot, Bigby, Candlesby, Nettleton, Louth and Flixton members). Jeans et al. (1991) used two of these terms (Louth, Flixton) in the succession at Dover, Kent, effectively taking a nomenclature established in the thin succession of the East Midlands Shelf, south, into the Anglo-Paris Basin. His members have not been utilised significantly in subsequent papers. The “Lower Chalk” of north Norfolk, Lincolnshire and Yorkshire is different to that further south, as it is characterised by hard chalks with low clay content. Most workers endorse the use of the Ferriby Chalk Formation for this unit. The only significantly different usage is by Jeans, who uses Lower Chalk from north to south, and throughout he applies (member status equivalent) lithological units that are approximately equivalent to the successions identified by Robaszynski et al. (1998) in southern England. Wood and Smith (1978) [Fig.6/5] divided the Chalk Group of the Northern Province into four formations, in ascending order, the Ferriby Chalk, Welton Chalk, Burnham Chalk and Flamborough Chalk formations, typically some 25, 50, 150 and 260 m in thickness respectively. 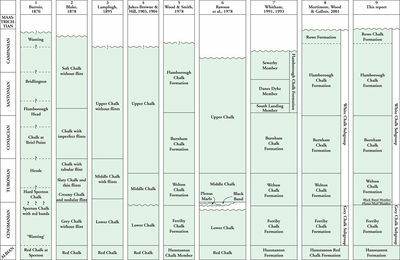 In the updated scheme used in this account, the basal part of their Ferriby Formation is treated as a separate unit named the Hunstanton Formation (about 3 m thick) and excluded from the Chalk Group. Above the Flamborough Chalk Formation an additional unit, the Rowe Chalk Formation, is recognised beneath the drift cover of Holderness (Figure 6). These six units are based on gross lithological characteristics, such as the presence or absence of flints, and thus the classification can be easily applied in exposures and has the potential for use in field mapping. Given some initial knowledge of the stratigraphical context, the units (with the local exception of the Hunstanton Formation) are potentially recognisable on the basis of geophysical borehole logs alone. Because the boundary between the Northern and Southern provinces is somewhat diffuse, the Chalk Group in southern Lincolnshire acquires many of the characters of the Southern Province succession. Nevertheless, it is convenient to apply the same Northern Province stratigraphical terminology to the whole of this region. In south Norfolk, to the south of The Wash, the Southern Province terminology is used (but see proviso discussed in section 3 above and note the use of the term Ferriby Formation as noted above). In the thicker Chalk succession in the southern North Sea, the same Northern Province units can be recognised though a different nomenclature is used; the Rødby, Hidra, Herring, Lamplugh and Jukes formations correspond approximately with the Hunstanton, Ferriby Chalk, Welton Chalk, Burnham Chalk and Flamborough Chalk formations onshore (Lott and Knox, 1994) [Fig.11/4], and the Rowe Formation is fully developed (note that the Chalk Group as defined in Lott and Knox, 1994, also includes the Ekofisk Formation of basal Palaeogene age throughout the North Sea). BGS Lexicon-style definitions of the component formations of the Chalk Group in Yorkshire and Lincolnshire are given below. The development of the terminology, thickness, distribution and full member and bed description of the formations is discussed in Sumbler (1999) and, within the context of the scheme approved at the November meeting, is summarised below. The Hunstanton Formation, commonly referred to as the Red Chalk, is of Lower Cretaceous (Albian) age. Partly because of this, its lithostratigraphical classification has been controversial. Wood and Smith (1978), Gaunt et al. (1992), Berridge and Pattison (1994) and Sumbler (1996) all regarded it as a part of the Ferriby Chalk Formation (Hunstanton [Chalk] Member), but many other workers have treated it as a separate formation (e.g. see discussion of Wood and Smith, 1978), or even as a member, included in one discussion with the underlying Carstone (e.g. Kelly and Rawson, 1983). Recent works (Rawson, 1992; Gallois, 1994; Owen, 1995, Mitchell, 1995a), whilst disagreeing over the precise nomenclature or indeed whether or not it forms a part of the Chalk Group, all treat it as a distinct formation. The consensus in the meeting held at BGS Keyworth in November 1999 was that it was a formation, but not part of the newly defined Chalk Group, and as defined it is older than the major hiatus at the base of the Cenomanian. Because of its close association with the rest of the Chalk Group and historical background in the literature it is discussed herein. The Hunstanton Formation is present throughout Yorkshire and Lincolnshire, and extends southwards to the type locality of Hunstanton [TF 67 40] on the north Norfolk coast, but only a few kilometres south it passes into mudstones of the Gault Formation (Gallois, 1994). At Hunstanton, it comprises about 1 m of reddish brown, sandy chalk or limestone with marl seams; its top is defined by an erosion surface that marks the striking change in colour with the overlying off-white chalks (Owen, 1995). North of the Wash, the Hunstanton Formation thickens substantially, averaging about 3 m over the East Midlands Shelf, e.g. at South Ferriby Quarry [SE 99 20] (Gaunt et al. 1992; Figure 3), an important reference section that is more typical of the formation in general than is the type section at Hunstanton and may be better regarded as a replacement type section therefore. It comprises marls and both rubbly and massive chalks that are mainly a distinctive pink to brick-red colour caused by disseminated hematite. It overlies the Carstone Formation with the contact between the two formations commonly gradational, although non-sequential with phosphatised burrows in places. A thin 1 m succession more like that at Hunstanton, is developed over the Market Weighton High where it also includes the few centimetres of the Carstone (Jeans, 1973) and rests unconformably on Jurassic mudstones. A thick (24 to 30 m) and more complete succession, overlying the Speeton Clay, is developed in the Cleveland Basin (strictly a term applicable to the Jurassic strata only but commonly used as a shorthand for the thicker Cretaceous strata north of the Flamborough – Dowsing Fault Zone, succession that have affinities to the Central North Sea Basin), in the cliffs at Speeton [TA 165 751] (Wright, 1963, Jeans, 1973; 1980; Neale, 1974; Mitchell, 1995a), and possibly in boreholes inland around Fordon. The top of the formation as now defined is marked by a well-defined burrowed horizon (Mitchell, 1995a). The succession at Hunstanton has been divided into a number of units based on criteria such as lithology and fossil assemblages (Andrews, 1983; Owen, 1995). The sections at South Ferriby Quarry (Morter, in Gaunt et al., 1992), and Speeton (Mitchell, 1995a) have likewise been subdivided, a correlation between the three sites, and a formal nomenclature, is suggested by Mitchell (1995a). The Ferriby Chalk Formation corresponds approximately to the Lower Chalk of many previous accounts, although some included the sub-Black Band marls (now Plenus Marls Member) at the top. Rawson et al. (2001) exclude the Plenus Marls Member from this formation. Its type locality is South Ferriby Quarry [SE 9915 2045] (Wood and Smith, 1978; Gaunt et al., 1992). The Ferriby Chalk Formation is dominated by grey, marly chalk, which weathers to buff in exposures, and gives rise to rather marly soils. It is flint-free throughout, and was mapped as ‘Chalk without Flints’ by the Geological Survey in the 19th century. As well as marly chalks with some discrete marl bands, ‘gritty’ bioclastic chalks and hard, cemented chalks occur, defining a number of sedimentary rhythms (Jeans, 1980). This rhythmicity is thought to have been climatically controlled and related to periodic variations in the earth’s orbital and rotational parameters (Milankovitch cycles; e.g. Gale, 1995). Most of the named marker beds can be traced throughout the Northern Province and have been used to define seven members (Jeans, 1980), although these members have not gained widespread use. The marker beds are, in ascending order, the Paradoxica Bed (or Sponge Bed; the Belchford Member of Jeans, 1980; the Crowe’s Shoot Member of Mitchell, 1995a); the Lower Inoceramus Bed; the Upper Inoceramus Bed; the Lower Orbirhynchia Bed; the Totternhoe Stone (the Grey Bed of Hill, 1888) [note that the erosion surface beneath this marker bed is recognised in the Southern Province as the base of the Zig Zag Member]; Upper Orbirhynchia Bed (Jeans, 1980); the Lower Pink Band; the Nettleton Pycnodonte Bed (formerly Gryphaea Band); the Nettleton Stone (the Nettleton Member or ‘Three-feet-six-inch Bed’ of Jeans, 1980; the ‘Jukes-Browne Band’ of Murray, 1986); and the Upper Pink Band. Apart form its lowest beds; the Welton Formation is dominated by massive or thickly bedded chalk containing flint nodules (as distinct from tabular flints). It comprises the lower part of the unit of ‘Chalk with Flints’ shown on early geological maps and corresponds approximately with the Middle Chalk of earlier accounts (Jukes Browne and Hill, 1904), though the latter excluded the basal beds (Plenus Marls Member) of the Welton Formation. Rawson et al. (2001) [Fig.2/11] in unifying the base of the White Chalk Group, in both the Northern and Southern provinces, at the base of the Plenus Marls Member effectively included the Plenus Marls Member within the Welton Chalk Formation, thus defining the base of this formation at the sub-plenus erosion surface. The correlation of the Plenus Marls and Black Band members within the base of the Welton Chalk Formation has been “one of the most contentious and unresolved issues in English Chalk stratigraphy” (Wood and Mortimore, 1995). This contention has rested on the placing of the distinctive Black Band and associated beds of the Northern Province with respect to the Plenus Marls of Jefferies (1963) in the Southern Province. The succession is a thin but complex unit of yellow-brown to green coloured marls and marly chalk with at least two distinct ‘black’ marl bands marking anoxic depositional conditions. They generally form a hollow at outcrop corresponding to the base of the formation. This marly succession can be recognised in boreholes from its distinctive geophysical log signature. The member is generally about 0.5 to 1.4 m thick but is much thinner in south Lincolnshire. The earliest references to this succession all describe, in varying levels of detail, multicoloured (including black) laminated or shaly clay (Judd, 1867; Blake, 1878; Dakyns and Fox-Strangways, 1886; Dakyns et al., 1886) and the term ‘black band’ came into use. Hill (1888) described “the Zone of Belemnitella plena” which always included “dark grey, in places almost black” marl in the centre of a thin marly succession. Rowe (1904) described the “black band” at Speeton [TA 19 74] and regarded it as the Yorkshire equivalent of the Plenus Marls. Wright and Wright (1942), quoting the section published in Hill (1888), used the ‘Black Band’ to cover their bed 7 (an amalgamation of beds 9 to 11 of Hill). In so doing formally extending the term to include the marly beds above and below the black band itself. Wood and Smith (1978) treated this thin succession (their “Basal Beds”) as the lowest unit of the Welton Formation. They reserved the formal name of the Black Band for the bed of “dark laminated marl lying in the middle of a complex of marls” and this classification was generally accepted. Jeans (1980) used the name “Flixton Member”, and Whitham (1991) the term “Plenus Marls complex” to cover the same interval. Wood and Mortimore (1995) preferred the term “Variegated Beds” to cover the “standard Black Band succession of eastern England (Northern Province)” to avoid confusion. Dodsworth (1996) has divided the succession into eight units (Beds A to H) that can be correlated across the region. The base of the succession (and thus of the Welton Formation) rests upon an erosion surface (see above) that is often highly irregular, and may be stained with iron minerals and glauconite. The belemnite Actinocamax plenus (now Praeactinocamax plenus) has been recorded (Jefferies, 1963; Whitham, 1991, Gaunt et al, 1992) from the basal beds (A and B of Dodsworth, 1996). This demonstrates the equivalence of this part of the succession to the Plenus Marls as developed in Southern England. The Black Band (Beds C, D and E of Dodsworth, 1996) in the middle or upper part of the succession is generally 20 or 30 cm thick. The Black Band comprises very dark grey to black or purplish bituminous marl indicating nearly anaerobic bottom conditions (the so-called Oceanic Anoxic Event) at the Cenomanian-Turonian stage boundary (Hart and Bigg, 1981). However, higher parts of the member (the Black Band proper and above) post-date the youngest part of the Plenus Marls of the south, being equivalent to the basal part of the Melbourn Rock (the Meads Marls succession) (Jefferies, 1963; Wood and Mortimore, 1995). Wood et al. (1997) described an expanded Cenomanian – Turonian Boundary succession in new excavations at Melton Ross Quarry. They described a “Central Limestone” (equivalent to Bed A of Dodsworth, 1996 in the standard Lincolnshire succession), which they also equated with the Plenus Marls Bed 3 of Jefferies (1963). The succession below, and hitherto unrecorded in the literature, they divided into Beds I to VII and equated to Jefferies Beds 1 and 2. The Central Limestone (divided by them into Beds 1 to 4) and beds above (Beds 5 to 10) they regarded as equivalent to the standard Lincolnshire succession previously described by Dodsworth (1996). Bed 7 (a to c) they equated to the Black Band sensu stricto (Beds C to E of Dodsworth, 1996). Bed 5 of Wood et al. (1997) contains the belemnite from which the Plenus Marls takes its name but it is not stated whether they believe their Bed 6 to be equivalent to the higher Plenus Marls succession or to the post-plenus succession. The Black Band does not occur south of the neighbourhood of Louth (Bower and Farmery, 1910; Wood, 1980; Hart et al., 1993; Dodsworth, 1996), so that the succession in the south of the region is much like that of Southern England. Thus, to achieve equivalence between the provinces, the term Plenus Marls Member as applied to the Northern Province should be restricted to those beds beneath the Black Band. The Black Band and marl beds above up to the incoming of inoceramid debris are equivalent to part of the Melbourn Rock Member of the Southern Province and perhaps demands the status of a separate Black Band Member (proposed herein). The Welton Formation above the Plenus Marls and Black Band members corresponds with the lower half of the unit of ‘Chalk with Flints’ shown on early geological maps of the region. In full successions the Black Band Member (herein defined, see below) is succeeded by several metres of gritty chalks containing abundant shells and shell debris of the inoceramid bivalve Mytiloides labiatus, the zonal index fossil. These beds correspond with the upper part of the Melbourn Rock and the overlying part of the Holywell Nodular Chalk Formation of the Southern Province. At Speeton, Mitchell (2000) has named this 2.2 m thick unit the Buckton Member. Above these basal shelly chalks, the bulk of the Welton Formation is composed of pure, white chalk with flint. It is 43 m thick at the type locality (Whitham, 1991) thinning slightly to the south. This unit is thicker on the Yorkshire coast where Mitchell (2000) recorded about 51 m. There are conspicuous flint bands and marl seams, of bed status, forming important markers (Wood and Smith, 1978; Gaunt et al, 1992; Whitham, 1991. The Melton Ross Marl, about two-thirds up in the Welton Formation is the most prominent marker in sections and boreholes, and being identified with the Southerham Marl of Sussex (Mortimore and Wood, 1986), is crucial in the framework of inter-Province and regional correlation. The Burnham Formation is characterised by thinly bedded chalk with common tabular and semi-tabular (discontinuous) flint bands. It forms the upper part of the ‘Chalk with Flints’ of early geological maps, or the lower part of the Upper Chalk of Jukes-Browne and Hill (1904). The chalk in the lower part of the formation is particularly hard, and forms a conspicuous outstanding feature, facilitating mapping of the base of the formation in the drift-free areas. The type locality for the base of the formation is the disused Burnham Lodge Quarry [TA 0685 1720] south of Barrow upon Humber. The succession in the overlying beds has been pieced together from various quarries and boreholes, particularly those drilled at Killingholme [TA 16 19] (Wood and Smith, 1978; Gaunt et al., 1992; Berridge and Pattison, 1994; Whitham, 1991). As in the Welton Formation, marl seams and flint bands form widespread marker horizons, in addition to several bands of thinly laminated chalk which are also useful for correlation. The chalks become softer in the southern part of the Province, indicative of the transition towards the Southern Province succession. The lowest few metres of the formation are characterised by hard chalk and thick, closely spaced, tabular flints, and equates with part of the Brandon Flint Series of Norfolk (this series is the flint maximum within the upper Turonian and is further equated with the ‘Basal Complex’ in Kent and the succession from the Bridgewick to BoPeep flints in Sussex thus demonstrating this part of the lower Lewes Nodular Chalk Formation is equivalent to the mapped base of the Burnham Chalk Formation). Rare specimens of the ammonite Hyphantoceras reussianum (Orbigny) from the beds just below and above the Wootton Marls (Gaunt et al. 1992; Whitham, 1991), suggest an approximate equivalence to the Chalk Rock Member within the Lewes Nodular Chalk Formation in the Southern Province. The Little Weighton Marls or the “Conoco Marls” of Barker et al., (1984), are three thin marl seams (typically 2 cm) within 2 to 3 m of chalk. The lower two of the three marls are thought to correlate with the paired East Cliff or Shoreham Marls of the Southern Province. The upper of these two marls (corresponding with Little Weighton Marl 2) is taken to mark the base of the Hagenowia rostrata Zone, which corresponds approximately with the base of the Micraster coranguinum Zone of the Southern Province. The irregular semi-tabular Eppleworth Flint, about 30 cm thick and generally about 65 to 70 m above the base of the formation, is probably the most substantial flint band in the entire succession, possibly equating with the East Cliff Semitabular or Seven Sisters Flint of the Southern Province (Mortimore and Wood, 1986). The succeeding beds are massive chalk with marl partings and small lenticular and nodular flints with two notable markers the De la Pole Flint and the Middleton Marl (or East Halton Marl). The higher beds of the Burnham Formation are poorly known inland except from boreholes and typically contain pale grey lenticular flints, and bands of small nodular flints, often associated with thin marly laminae. A notable marker bed, 26 m above the Middleton Marl, proved in a borehole [TA 1732 1905] at Killingholme is a carious tabular flint overlain by chalk with Inoceramus shell debris (Berridge and Pattison, 1994). Several boreholes in this area prove a white, or incipient flint, some 14 m higher. This appears to be the highest substantial flint in the succession and it therefore defines the top of the formation. At Flamborough Head, and in the cliffs to the north, the topmost flint is known as the High Stacks Flint (Whitham, 1991). Inland in a quarry section at Langtoft [SE 973 512] (Whitham, 1991) it remains uncertain whether or not the topmost flint is at the same stratigraphical horizon, but it seems unlikely. The Flamborough Chalk Formation is the youngest formation recognised in the Chalk exposed at outcrop in this region. It is essentially flint-free, and comprises the upper unit of ‘Chalk without flints’ mapped by the Geological Survey in the 19th century. Much of the succession is also generally less hard than the chalk in the underlying Burnham Formation, being lithologically similar to the chalks of southern England. The cliffs constituting the type section of the Flamborough Formation are described by Lamplugh (1895), Rowe (1904), Neale (1974), Rawson and Whitham (1992), Whitham (1992; 1993) and Mitchell (1994; 1995b). The succession is difficult to measure accurately, because of cliff falls, minor structures and some gaps in exposure, and it is likely that all these accounts contain minor errors. The most complete and detailed description is by Whitham (1993), who introduced names for various marker beds. However, because of the lack of comparative sections elsewhere, it remains uncertain how laterally persistent these named markers are, or to what degree the stratigraphy of the designated type section is representative of the formation on a regional basis. At the type section, the formation comprises white, flint-free chalk with numerous regularly spaced marl seams typically 1 to 3 cm thick. Some of the thicker marls named as marker horizons are seen to vary greatly in thickness, or split into multiple bands when traced laterally over fairly short distances, and this inevitably complicates correlation with sections elsewhere. Whitham (1993) subdivided the succession at the type section into three members, the South Landing, Danes Dyke and Sewerby members, which have somewhat different lithological characteristics. The South Landing Member, about 21 m thick, comprises hard chalk with sporadic thin marl seams. The base of the member (and of the Flamborough Formation) is marked by the top of the High Stacks Flint, seen on the foreshore near High Stacks, Flamborough Head [TA 258 704]. About 3 m above is the High Stacks Marl, a 2 cm thick, grey, silty marl marker, with a thinner marl about 1 m below. This marker has not been observed at Langtoft Quarry [TA 012 661] north of Driffield, which also exposes the basal beds of the Flamborough Formation (Whitham, 1991), but it is unclear whether this indicates that the marl is discontinuous, or whether the base of the flint-free Flamborough chalks lies at a different horizon there. At the top of the member, a 1 m bed of relatively fossiliferous chalk with inoceramids, echinoids, and sponges, is overlain by the South Cliff Marl (Whitham, 1993), and regarded by him as being several metres below the top of the member. However, according to Mitchell (1994), it is the same as the East Nook Marl at the base of the succeeding Danes Dyke Member. The Danes Dyke Member is about 67 m thick and comprises thinly bedded, alternating hard and soft chalk with stylolites, and with common marl seams (86 in total), some of which are named (see Witham, 1993; Mitchell, 1994). It is less hard than the underlying South Landing Member, and the marls are far more abundant. The lowest are the three East Nook Marls, which occur in the basal few metres of the member. The base is marked by East Nook Marl 1, a grey, rather chalky marl seam, 2 to 3 cm thick. The peculiarly-shaped echinoid Hagenowia occurs fairly commonly in the chalks associated with these three marls, indicating the H. rostrata Zone. The base of the succeeding Uintacrinus socialis Zone, between 40 and 45 m thick, is defined by the first appearance of the zonal crinoid a few metres above. The Marsupites testudinarius Zone occurs in the upper third of the member above the lower of the Maidlands Upper Marls pair. The Sewerby Member constitutes the highest chalks exposed on the coast. Massive chalk dominate the sequence although the lower part comprises thinly bedded chalk with stylolites, much like the bulk of the underlying Danes Dyke Member. Marl seams are somewhat less common than in the Danes Dyke Member. About 71.5 m of beds are seen on the coast with (probably) slightly higher horizons being represented in quarries inland, although precisely how these inland sections relate to the coast is not certain. The lowest of the Danes Dyke Upper Marls marks the base of the member. Plates of the zonal crinoid Marsupites are common at some levels in the chalk associated with these marls, and in the succeeding 5 m or so. A bed with abundant inoceramid shell debris about 13 m above the base of the member was formerly taken as the base of the Sphenoceramus (Inoceramus) lingua Zone, but these beds are now assigned to the Uintacrinus anglicus Zone, defined by the range of that crinoid (Mitchell, 1995b), and taken as the basal zone of the Campanian Stage. Inland, quarries at Bessingby [TA 164 669] (Whitham, 1993) and at various localities around Bridlington (Rowe, 1904; Wright and Wright, 1942) expose chalk with marl bands that lie at a slightly higher stratigraphical level than those on the coast. A section at White Hill Reservoir [TA 165 713], Bridlington (Wright and Wright, 1942) is thought to have exposed the youngest chalk represented at outcrop inland. These beds probably belong to the Gonioteuthis quadrata Zone (Figure 3). The Rowe Chalk Formation are the youngest chalks of the region and occur in the coastal area of Holderness, where it is concealed beneath glacial drift deposits up to 50 m thick. Southwards from Hornsea, the total thickness of chalk strata above the Burnham Formation is approximately 300 to 350m. Microfaunal evidence from boreholes indicates that the beds here extend into the Belemnitella mucronata Zone, and specimens of the index belemnite have been found in the tills which cover the chalk of this area (Wood, 1980). Chippings and geophysical data from hydrocarbon wells in the Hornsea area would suggest that the largely flint-free chalks typifying the Flamborough Chalk Formation are about 260 to 280 m thick and are overlain by about 70 m of flint-bearing chalk. These flinty strata, and still higher beds, continue eastwards beneath the North Sea where they have been named the Rowe Formation (Lott and Knox, 1994). The base is thought to lie approximately at the base of the Belemnitella mucronata Zone. A digest of the development of terminology in the Northern Province is given in Figure 6. The lithostratigraphical units utilised on the 1:50 000 Geological maps and within the descriptive memoirs of the Northern Province of England. * this is the same map symbol as that used for the Holywell Nodular Chalk Formation of the Southern Province and it is recommended that this Northern Province symbol be changed to HuCk to avoid confusion. For definitions of the Chalk Group and its component Subgroups refer to the entries within Section 3 above. An entry is included for the Hunstanton Formation (Red Chalk) because of its historical association with the Chalk Group but from which it is now formally excluded. This page was last modified on 11 June 2014, at 11:49.